Please read carefully the following legally binding agreement between Bayview Technologies, Ltd. (which owns and operates this website on behalf of the Asian Poker Tour), Asian Poker Tour Limited (which owns and operates the Asian Poker Tour) and Bayview Technologies, Ltd. (which owns and operates this website on behalf of the Asian Poker Tour) and you. Please read the agreement carefully and make sure you fully understand its contents. Your use of this website and/or its products or services is deemed acceptance of this terms and conditions. If you have any doubts about your rights and obligations resulting from the acceptance of this agreement, please seek professional advice in your jurisdiction. By entering into this Agreement, you acknowledge that the Asian Poker Tour is part of a group of companies and in these terms and conditions, where the context allows, APT means the Asian Poker Tour and its subsidiaries, affiliates and any holding company and any subsidiary of any such holding company, and any associated company with the Asian Poker Tour such as but not limited to, those providing services to APT. In these terms and conditions, “you/yours” refers to the user of the Website (www.theasianpokertour.com), “Us/We/Ours/APT” refers to the Asian Poker Tour, the “Website” refers to www.theasianpokertour.com and “Services” refers to the sale of APT Event tickets. This agreement covers the arrangements between You and Us in relation to your use of the Website. 2.1 If you do not agree to any of the provisions of this Agreement you should immediately stop using the Website and/or the services or products offered therein. 2.2 We may, at our sole discretion, make changes to this Agreement at any time. Notification of such changes will be posted on the Website together with the date they will apply. If You continue to use the Website after We have updated the changes (regardless to the way we have notified of such changes), You agree to be bound by those changes whether or not You have had actual notice of, or have read, the relevant changes. If You do not agree to be bound by relevant changes, You should not continue to use the Website any further. 2.3 In the event of conflict, this Agreement shall prevail in over any other rules or documents referred to in this Agreement or posted in this Website. 2.5 You may not use the Website and/or the Service provided therein if (a) you are not of legal age to form a binding contract with APT, or (b) you are a person barred from doing so under the laws of the country in which you are resident or from which you use the Website and/or Service. We may, in our sole and absolute discretion, refuse to offer the Website and/or any Service provided therein to any person or entity, as well as to change our eligibility criteria at any time. 2.6 In reference to particular APT Events, you can only register if You are of legal age as determined by the law of the country where You live and/or the jurisdiction where the APT Event will be held. 2.7 The above notwithstanding, You cannot use participate in an APT Event if You are under 18 years of age in any circumstances. 2.8 You accept sole responsibility for determining whether Your participation in an APT Event is legal in the country where You live. YOU HAVE AN OBLIGATION TO MAKE THIS DETERMINATION BY MAKING THE APPROPRIATE ENQUIRIES IN YOUR COUNTRY. 3.1 All Content published on the Website, including, without limitation, images, photographs, graphics, animations, videos, audio and text (the “Site Content”) are owned by APT and/or its licensors and is protected by copyright and other intellectual property or other proprietary rights. You hereby acknowledge that by using the Website and any Service, you obtain no rights in the Website content, or any part thereof. Copying and/or amending all or part of our Website content, particularly for commercial or advertising purpose requires our prior written permission. The making of copies for personal and non-commercial use is permitted provided that attribution is made and you retain all copyright and other proprietary notices therein. Any other copying, amending, distribution or publication of the Website content without our prior written permission is prohibited. 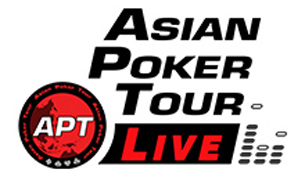 3.2 The “Asian Poker Tour” marks and logos are trademarks of Asian Poker Tour Limited. The use or the display of these trademarks without the explicit written permission of APT is prohibited. Nothing on the Website should be construed as granting, by implication, estoppel, or otherwise, any right or license to use any of the “Asian Poker Tour” marks without the prior explicit written consent of the APT. 3.3 Please be informed that we take pro-active measures in protecting our intellectual property to the fullest extent as may be permitted by applicable law. Any unauthorized use, reproduction, distribution of the Website, it’s content (or portion thereof), APT marks/logos, is expressly prohibited and any such activity will result in penalties as may be provided by applicable law. 4.1 You agree that you will pay for all products you purchase using the Service/s and that we may charge your selected payment method for any amount (including any taxes as may be applicable) that may be accrued in connection with the Service/s. 4.2 Your total price will include the price of the item purchased plus any applicable tax (if any). All sales using the Service/s are final and except as otherwise provided in the succeeding section, no refunds are allowed. 4.3 If an item becomes unavailable following a transaction, your sole and exclusive remedy is a refund. In which case, kindly contact us so that the arrangements can be made for a refund. 4.4 Your use of the Service includes the ability to enter into agreements and/or make transactions electronically. You acknowledge that your electronic submissions constitute your agreement and intent to be bound by and to pay for such agreements and transactions. Your agreement and intent to be bound by electronic submissions applies to all records relating to all transactions you enter into on this Website, including notices of cancellation, policies and contracts. 5.1 APT DOES NOT GUARANTEE, REPRESENT, OR WARRANT THAT YOUR USE OF THE WEBSITE AND/OR THE SERVICE/S WILL BE UNINTERRUPTED OR ERROR-FREE, AND YOU AGREE THAT FROM TIME TO TIME WE MAY REMOVE THE WEBSITE AND/OR SERVICE/S FOR INDEFINITE PERIODS OF TIME, OR CANCEL THE SERVICE/S AT ANY TIME, WITHOUT NOTICE TO YOU. 5.2 TO THE FULLEST EXTENT PERMITTED BY APPLICABLE LAW, YOU EXPRESSLY AGREE THAT YOUR USE OF, OR INABILITY TO USE, THE WEBSITE AND/OR SERVICE/S IS AT YOUR SOLE RISK. THE WEBSITE AND/OR SERVICE/S ARE PROVIDED “AS IS” AND “AS AVAILABLE” FOR YOUR USE, WITHOUT WARRANTIES OF ANY KIND, EITHER EXPRESS OR IMPLIED, INCLUDING ALL IMPLIED WARRANTIES OF MERCHANTABILITY, FITNESS FOR A PARTICULAR PURPOSE, TITLE, AND NONINFRINGEMENT. 5.3 TO THE FULLEST EXTENT PERMITTED BY APPLICABLE LAW, IN NO CASE SHALL APT, ITS DIRECTORS, OFFICERS, EMPLOYEES, AFFILIATES, AGENTS, CONTRACTORS, PRINCIPALS, OR LICENSORS BE LIABLE FOR ANY DIRECT, INDIRECT, INCIDENTAL, PUNITIVE, SPECIAL, OR CONSEQUENTIAL DAMAGES ARISING FROM YOUR USE OF THE WEBSITE AND/OR SERVICE/S OR FOR ANY OTHER CLAIM RELATED IN ANY WAY, INCLUDING, BUT NOT LIMITED TO, ANY ERRORS OR OMISSIONS IN ANY CONTENT, OR ANY LOSS OR DAMAGE OF ANY KIND INCURRED AS A RESULT OF THE USE OF ANY CONTENT (OR SERVICE) POSTED, TRANSMITTED, OR OTHERWISE MADE AVAILABLE, EVEN IF ADVISED OF THEIR POSSIBILITY. 5.4 WE SHALL USE REASONABLE EFFORTS TO PROTECT INFORMATION SUBMITTED BY YOU IN CONNECTION WITH THIS WEBSITE AND/OR SERVICE/S, BUT YOU AGREE THAT YOUR SUBMISSION OF SUCH INFORMATION IS AT YOUR SOLE RISK, AND APT HEREBY DISCLAIMS ANY AND ALL LIABILITY TO YOU FOR ANY LOSS OR LIABILITY RELATING TO SUCH INFORMATION IN ANY WAY. 5.5 BY USING THE WEBSITE AND/OR SERVICE/S, YOU AGREE, TO THE EXTENT PERMITTED BY LAW, TO INDEMNIFY AND HOLD APT, ITS DIRECTORS, OFFICERS, EMPLOYEES, AFFILIATES, AGENTS, CONTRACTORS, PRINCIPALS, AND LICENSORS HARMLESS WITH RESPECT TO ANY CLAIMS ARISING OUT OF YOUR BREACH OF THIS AGREEMENT, YOUR USE OF THE WEBSITE AND/OR BOOK SERVICE/S, OR ANY ACTION TAKEN BY APT AS PART OF ITS INVESTIGATION OF A SUSPECTED VIOLATION OF THIS AGREEMENT OR AS A RESULT OF ITS FINDING OR DECISION THAT A VIOLATION OF THIS AGREEMENT HAS OCCURRED. THIS MEANS THAT YOU CANNOT SUE OR RECOVER ANY DAMAGES FROM APT, ITS DIRECTORS, OFFICERS, EMPLOYEES, AFFILIATES, AGENTS, CONTRACTORS, PRINCIPALS, AND LICENSORS AS A RESULT OF ITS DECISION TO REMOVE OR REFUSE TO PROCESS ANY INFORMATION OR CONTENT, TO WARN YOU, TO SUSPEND OR TERMINATE YOUR ACCESS TO THE WEBSITE AND/OR SERVICE/S, OR TO TAKE ANY OTHER ACTION DURING THE INVESTIGATION OF A SUSPECTED VIOLATION OR AS A RESULT OF APT’S CONCLUSION THAT A VIOLATION OF THIS AGREEMENT HAS OCCURRED. THIS WAIVER AND INDEMNITY PROVISION APPLIES TO ALL VIOLATIONS DESCRIBED IN OR CONTEMPLATED BY THIS AGREEMENT. 6.1 This agreement is effective until terminated by either party. You may terminate by ceasing use of the Website and/or the Service/s. We may terminate immediately, without notice, if you fail to comply with any provision of this Agreement. You agree that any provisions of this Agreement which, by their terms, ought to survive, such as but not limited to, the rights of APT on intellectual property, shall survive termination of this Agremeent. 7.1 The construction, validity and performance of this agreement will be governed by the laws of the Philippines. However, this shall not prevent Us from bringing any action in the court of any other jurisdiction for injunctive or similar relief. The English language version of this Agreement will prevail over any other language version issued by Us. 7.2 The illegality, invalidity or enforceability of any part of this agreement will not affect the legality, validity or enforceability of the remainder. 8.1 You agree to receive communications from Us in an electronic form and/or delivered to Your e-mail address. All communications in either electronic or paper format will be considered to be in “writing” and to have been received no later than five business days after posting or dissemination, whether or not You have received or retrieved the Communication. We reserve the right, but assume no obligation, to provide communications in paper format. 8.2 Any notices required to be given in writing to Us or any questions concerning this Agreement should be addressed to the APT Support Team via Info@TheAsianPokerTour.com. 10.1 If any provision of this Agreement is found to be unlawful, void or for any reason unenforceable, then that provision shall be deemed severable from these terms and shall not affect the validity or enforceability of the remaining provisions. 10.2 This is the entire agreement between Us relating to the subject matter herein and supersedes any and all prior or contemporaneous written or oral agreements. 10.3 This Agreement is not transferrable or assignable by You, except with our written consent. We may however, transfer or assign this Agreement at our convenience subject only to notice to You. 10.4 No waiver by either party of any breach or default hereunder shall be deemed to be a waiver of any preceding or subsequent breach or default. 10.5 Any heading, caption or paragraph title contained herein is inserted only as a matter of convenience and in no way defines or explains the paragraph or provision thereof.